Welcome to the Greensboro Summer Solstice Festival! Featured here is the Dream Team – the behind the scenes talent that recruits, trains, schemes and implements the most creative festival in the city. These veterans and current leaders are dedicated to raising the bar year after year. We are deeply grateful for their contributions of style, skill and humor. Married to the Head Faerie for 40 years come this Solstice, Jim had no option but to join the ranks of the Solstice organizers. His attention to detail and his high level of integrity is often called upon for guidance. Jim loves to negotiate, plan and execute well laid plans and goes to great lengths to ensure that the Solstice logistics comes off smoothly year after year. His technology background and business savvy has helped move the event to new levels of success. When Jim is not pouring over Solstice details, he is on the golf course, in the pool hall, or doing projects around the homestead. He is the Wingman for the Head Faerie and the Go-To guy for everything that does not glitter. Upon his arrival in the Triad 10 years ago, the Summer Solstice Celebration was one of the first events Michael attended. As soon as he stepped foot into Lindley Park he knew he had found his tribe. He has been a regular ever since. Michael decided to become a part of the magic when simply attending just wasn’t enough. Over the last few years as a volunteer he pitched in where he could. While it was his Earth based nature as a Shamanic Lightworker that drew him to the Solstice Celebration to begin with, it was his experience as a project manager that helped him identify the need for his skills at Faerie Central. Michael was also drawn by the community spirit that permeates the Solstice Celebration. It is the same energy that inspires him to facilitate the New Moon/ Full Moon Drum Circles and Spiritual Talking Circles at Ohana Arts & Healing along with the First Friday Drum Circle at Center City Park in downtown Greensboro. I’m a journalist, photographer, sound engineer and musician living in Greensboro. I’ve done sound at the Blind Tiger, Guilford College, Greensboro Recording Collective, Flatiron, Green Bean, Fireflies Festival, Heavy Rebel Weekender, Dotmatrix Project, Summer Solstice and Elvisfest. My singing and bass playing can be heard on the Raving Knave’s 2011 CD “Love in the Atom Age” and Boxcar Bertha’s 2005 CD “Guilty County Stomp.” I’ve also played with Empire for Rent, Sugercoma, and D.B. Cooper and the Hijackers. I’m currently playing bass in the Grand Ole Uproar. Bill Donnell, a Summerfield resident & owner of Summerfield Sound, loves to play music with like-minded friends. He is also president of “Friends at the Beach” concierge services, which assists people vacationing on Oak Island to find what they need. He is retired from a long career with local government of Guilford County and is now involved with many fun entrepreneurial endeavors with friends. John Paul has been playing guitar since high school. Then bass, banjo, mandolin, percussion. So many instruments, so ADD. He loves to play, sing, and write with other muse-icians. He is a confessed Creataholic. For about 20 years JP has been hearing voices in his head. They sing and play original songs. So he learned how to record them, and record others who hear such stuff in their heads, at his Steampowered Studio. Steam was a great sound effect on train songs, not so good on others. The studio now runs on electricity. Doing live sound for the Butterfly Stage at Summer Solstice the past few years gave him the idea of Butterfly Power. Very quiet, but the lovely things keep morphing. 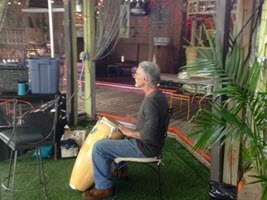 He often ponders this as he runs sound while playing his conga, thanking Sue Sassmann for the opportunity to do so. 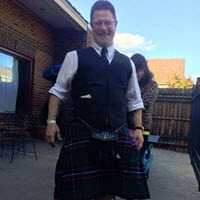 Stuart V. Stanley is a local musician, Thespian and enthusiastic kilted weirdo who is proud to be a part of Summer solstice for another great year! Stuart has both performed and stage managed for several years now. Stuart lives in Morrisville NC with his beautiful wife Bonnie and works full time as an Apartment maintenance supervisor and also does handyman work on the side. He is a blend of his parents — a super creative techie who takes life as it comes & sails through with an easy going disposition. Boomer is the first contact with the public on Solstice Day — guiding the 100+ vendors to their destination, then filling in wherever needed throughout the day. A graduate of Appalachian State University, with a degree in Industrial Design, Boomer is in his 12th year of running Big Boom Design and loving every minute of it. On the weekends you can find him tinkering on some type of automotive project or enjoying the beautiful view of the mountains at his home in Asheville, NC. He loves to talk about the internet and always welcomes the chance to brainstorm over a local Asheville brew or tasty cup of coffee. Scott Fray and Madelyn Greco are a pair of US bodypainting artists, the first and only to have won five World Championship titles. The couple has appeared on air to detail their art and lives for NPR, on several shows. 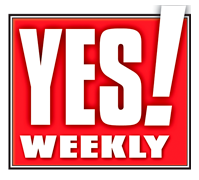 They have been showcased in print media or online by CNN, MSN, YahooNews, InternationalBusinessTimes.com, SportsIllustrated.com and FOX-8 NC. Fine art representation of LivingBrush’s work has been featured prominently in several internationally-published books on the subject. Scott and Madelyn’s work has gained notoriety via a variety of global trade publications, as well as numerous regional publications. 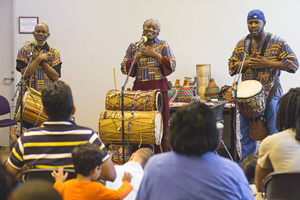 Sandy Blocker is the University Accompanist at Elon University who plays world percussion instruments for modern, ballet and African dance classes. His professional training in ballet when he was younger makes him very in tune, and an ideal accompanist for the dance students and professors within the dance department. Scott Hinzman began his study of flow in early 2000. 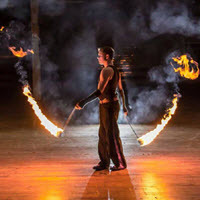 Upon discovering a passion for fire, flow, and circus arts, he tirelessly trains and explores techniques and movement to further his means to express himself as an artist. He has been practicing the arts of poi, contact staff, double staff, fire eating, buugeng (s-staff), contact juggling, and acro yoga. Scott specializes in designing custom performances with both fire and LED props. He has performed at many events around NC, including the annual Greensboro Summer Solstice Festival and many others. He has taught several workshops and is currently teaching regular workshops that cater to variable levels of skill at Studio Eleve’. Major Sponsor, African Dancer, Trash Czar, Drum Coordinator, tuna salad maker — Kathy Rooney is one of those New Orleans gals who knows how to throw and enjoy a great party. She created and has managed her business, Rolfing Associates of the Triad, for over 25 years and continues to throw herself into her passions. We are fortunate to have Kathy in our corner — multi-talented, fearless and super capable. 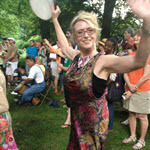 One of the “Founding Faeries” who helped build the foundation of the Solstice Celebration. Since 2005, she has worked all over the board, behind the scenes and in front of the crowd — decorating, organizing and managing the plethora of details that come flying at Faerie Central. This faerie goddess has always been loyal to the cause and continues to bring beauty and magic to the Solstice. She has the financial smarts, strong work ethic and the class to hold the title of Grand Dame. 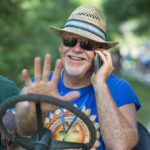 In the early years, Kenny worked hard behind the scenes to bring organization to the festival, handling copious numbers of vendors & details , streamlining processes & staying on top of the loosely constructed Solstice plan. It is because of people like Kenny that chaos became more orderly and reason was brought to bear. She would not refer to herself as a Faerie Goddess. And that’s because she is the one and only Grand Dame.